LILLINGTON -- Electronics Engineering Technology students at Central Carolina Community College's Harnett County Campus now have a state-of-the-art Weller WX 1020 soldering system with which to learn and practice their skills. Businessman Nick Mescia donated the new equipment. He is a manufacturing process documentation consultant at Sensus Metering and a member of the technology program's Advisory Committee for almost 12 years. He presented the system to Gary Beasley, CCCC's lead Electronics Engineering/Laser and Photonics Technology instructor, July 11 at Sensus Metering's Morrisville plant. "When we have Advisory Committee meetings, Gary always asks the members, 'Can you donate any equipment to the program,'" Mescia said. "I thought it would be nice for him and the students to get something brand-new." Mescia won the unit as the top door prize at the Surface Mount Technology Association's (SMTA) June 19 Carolinas Chapter Golf Tournament at The Neuse Golf Course in Clayton. 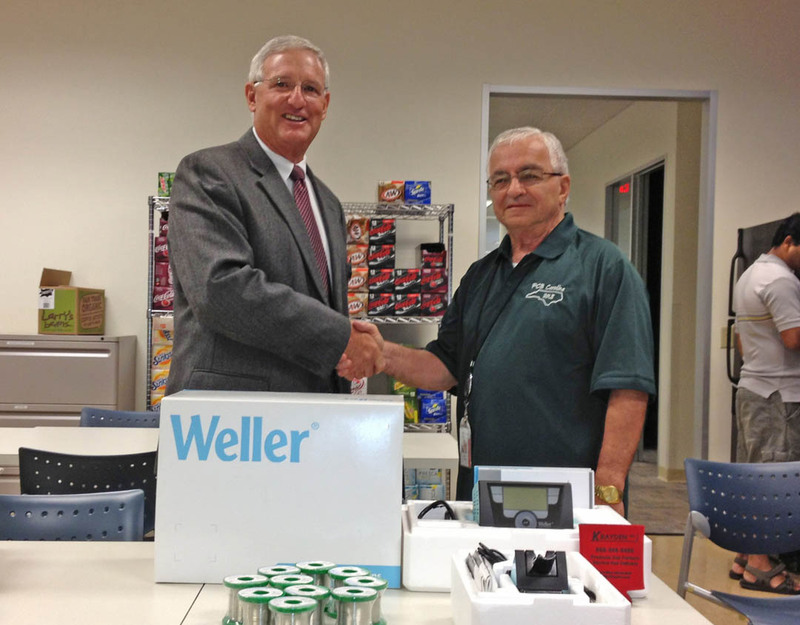 "Weller Corp. was excited when they found out I planned to donate it," Mescia said. "Kraydon Inc., which represents Alpha Metals, decided to donate solder to go with the system to help the kids." The soldering system is valued at about $700. Mescia downplayed his generosity, saying it wasn't a big deal considering that electronics engineering equipment can cost hundreds of thousands of dollars. But, to Beasley, it is a big deal. "The state-of-the-art soldering system generously donated by Mr. Mescia will provide the students with opportunity to gain experience on the type of equipment they will probably see in industry," Beasley said. "Our program is very fortunate to have active, and thoughtful Advisory Committee members such as Nick Mescia." The soldering system and solder were donated through the CCCC Foundation, a 501(c)(3) charitable organization affiliated with, but independent of, the college. For information on giving through the Foundation call 919-718-7230 or email Emily Hare at ehare@cccc.edu. For information on CCCC programs, including Electronics Engineering, visit www.cccc.edu.